Is Arrow The Best Batman TV Show? I’m not saying that that’s a bad thing as it has worked out perfectly. On paper there is no way this show should work. A super hero show on the CW where we explore the relationship between Oliver Queen, Laurel (Dinah) Lance, and their peers. Ugh. Sounded horrible. I passed until I kept hearing after the first season that it was actually pretty good. I saw it on Netflix and figured why not. After the first episode I was hooked. Since then we’ve seen them borrow plenty from the Batverse. Deathstroke while not defined as a Bat Villian has played a big part in the Bat mythos. Rhas Al Ghul and the League Of Assassins were the center point of season 3. Similar starts being portrayed as a dark vigilante. A secret headquarters full of gadgets and weapons. Eventually creating a superhero family around him. Last season his tech savy girlfriend and side kick Felicity got shot and was in a wheelchair giving her an Oracle feel about her. This week we’ve been watching a 4 part crossover between all the CW DC shows (which we can thank Arrow for all the spin off shows) called INVASION! Slight spoilers below. On Flash we saw that a handfull of the heroes were abducted by the Dominators. On Arrow we find that the heroes (Oliver, Sarah, John, Ray, and Thea) were hooked up to a machine that put them in a dream state where they were living out what would be their perfect life. This immediately made me think of . . . yep something from Batman. Specifically Batman: The Animated Series. In an episode titled Perchance To Dream Bruce Wayne awakens to find that his parents never died. He’s happy and it turns out that someone else is Batman so he can just relax and enjoy life as Bruce Wayne. But of course nothing ever stays happy. What I didn’t know about this episode was that it was written by horror novelist Joe R. Lansdale. There is always minor things like this that make me think more and more that I was right about the original pitch meeting. I’m not sure why I’m okay with that happening on this show as any other show stealing ideas, villians, or storylines I would not be very excited about it. But with the CW DC Universe I am perfectly fine. Maybe it’s my distaste of Gotham that lets me enjoy this as my Batman alternative. Regardless I’ll still be tuning in every week. What do you think? Felicity does have that Oracle vibe about her even before the wheelchair. One episode showed Black Canary (Sarah) living in a clock tower. Oracle Did the same in the comics and in Birds of Prey Tv series. I like Felicity, but keep her away from Oliver. Their relationship got too CW for me. As for the four part crossover, it was good. But I hated to see Flash get so much hate because of Flash Point, yes he F’ed things up but everyone went after him all at once. 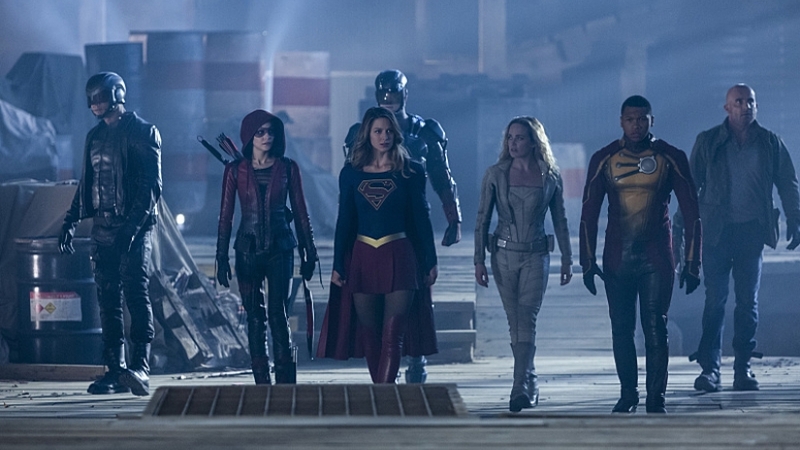 Hopefully down the line we get another huge crossover where Legends of Tomorrow is the focus and everyone has to go back in time to save the world.